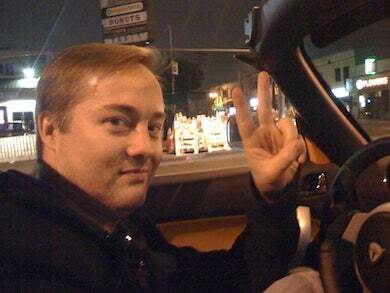 On January 1st, Autoblog/Engadget/Mahalo founder Jason Calacanis announced he'd give away one still-imaginary Tesla sedan if his newly-created Twitter account got more followers than Ashton Kutcher. He failed miserably. Also, he probably never planned to give the car away. Update! well @raywert writes for jalopsuck which will never be as good as Autoblog.com so he has to hate on me. dbag! @raywert 1. you are an idiot. 2. you are a hater. Those are no ad hominem, those are accurate. To recap: Jason Calacanis was the co-founder of Weblogs, Inc, which he sold to AOL during the "blogging boom" of 2005 for $30 million. Now, he's the CEO of Maholo, an irrelevant-the-next-time-Google-changes-its-search-algorithm human-powered search engine. Finding himself with loaded pockets, but still struggling to impress with the size of his Twitter account, Jason decided to challenge Ashton Kutcher to a Twitter duel, with mastery of the micro-blogging service's coveted number one slot as the prize. It's unclear if Ashton was ever aware of the challenge, but Calacanis tried for maximum publicity by offering a Tesla Model S — a not-yet-built electric sedan — as a prize for one lucky follower if he beat Ashton. We are at 10k followers & I'm excited! We're going to get this done! Anyone know NYT, WSJ or good press? pitch them #freetesla story! Kutcher's account, @Aplusk, averages over 3,000 new followers a day. The @auto contest is going so well I've started 2nd contest! tweet: " Follow @jason to win one of ten Nexus One phones today #freenexusone "
That was @auto's last tweet, but it did result in an additional 10,000 followers for Jason's main twitter account, @Jason. We're assuming Calacanis is smart enough to know he wasn't going to be able to beat Ashton Kutcher's follower count by giving away one electric family sedan that's not yet out of the concept stage. That leads us to believe the whole deal was an underhanded attempt to net himself additional Internet stardom without actually having to give away anything. Thus, a scam. Calacanis has yet to respond to our tweet asking for more information, but we've now unfollowed him anyway — we have other people we'd rather talk to.